The release of the White Paper by the U.S. airlines accusing the Gulf airlines of anti-competitive behavior has spurred many reactions that we've covered in our recent podcast episodes. Tim Clark is currently in Washington, meeting with US transport officials to tackle the claims that subsidies have funded Emirates' growth. There are a lot of quotables in the report, showing, as Alex mentioned in our last podcast episode, that it is directed at a general public (the U.S. airlines White Paper is much drier). Here are some extracts—the full report is at the end of the post. Although Emirates, as a profitable and commercially run carrier, is fundamentally against the practice of airlines receiving state subsidies, we understand that it may take time for the practice to be wholly eliminated from our industry. Market-distorting subsidies can take many forms. The state-run Korea Development Bank froze 3.76 trillion Korean Won (US$3.3bn) worth of debts from Asiana Airlines in 2010. This is a very clear example of subsidy, as was the €500 million “bride price” given to Austrian Airlines from the Austrian Government, prior to the September 2009 takeover by Lufthansa. Tax breaks, underwritten war risk insurance and “one time” state-bank loans are forms of subsidy, even if “approved” by governments. Although not a subsidy per se, Chapter 11 protection in the US also has a significant market effect, by providing a level of protection for airline bankruptcy reorganisation that is seldom found in other markets. The Star Alliance is the world’s largest airline group and 13 of its carriers - nearly half of its membership - have received subsidies and state aid totaling more than €6.8 billion. Dubai’s corporate model has its origins in the city’s historic position as an entrepôt, which has free trade and competitive open markets at its core. Whilst there is a close relationship between the government and many of Dubai’s strategic commercial entities, Dubai is at its essence driven by commercial entrepreneurial principles. The Gulf region is not a single entity. Dubai has almost no hydrocarbon reserves while the situation is vastly different in oil wealthy Saudi Arabia, Qatar and Abu Dhabi. So why would the airlines from these areas all be the same? 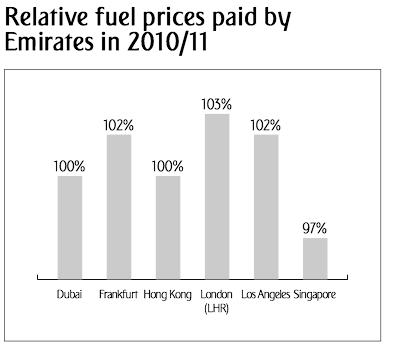 Emirates itself is at a disadvantage compared with Singapore Airlines, which has lower relative labour costs and can also take advantage of Singapore’s status as a jet fuel refining hub, where the price of a barrel of jet fuel is the lowest in the world. Adding: This is a commercial reality. Emirates has no qualms about this and is happy to compete in this operating environment. In truth, there are more than 35 separate airlines in the Middle East which compete against each other and against carriers based in other regions. In the Gulf there are 15 airlines, including a growing number focused on budget travel. Dubai International ranked as the fifth costliest airport, more expensive than charges in Beijing, Kuala Lumpur and Doha. Vienna Airport was government held for 50 years until its partial privatisation in the 1990s; it is now 40% state controlled. A similar history is found at Munich and Frankfurt. Frankfurt Airport (Fraport) is now 51% controlled by the German regional and city government (with Lufthansa owning 10%, and private investors holding the rest). For the first five decades of its existence, however, it was fully government owned. in Dubai and the Gulf, despite themselves continuing to benefit from state-funding of airports. In April 2011, the European Commission opened an investigation into Leipzig-Halle airport, which received €225 million in funding for infrastructure from its state owners, making charges lower than would be the case if the airport had to fund the improvements at market rates. Lufthansa, operating around 30% of all flights from the airport, has benefitted the most from this public funding. more than 8,600 current staff have served for 10 years or longer and in excess of 2,100 have been with the company for 20 years or more. Emirates receives on average 25,000 new employment applications each month. That last graphic is quite staggering. No wonder Lufthansa is in a period of struggle with its staff, with its attempts to offload operations to its low cost structure, Eurowings. It would have been interesting to see where Turkish, a flag-carrier in the middle of a transformation, is ranked (estimates say that it has costs 30% cheaper that Lufthansa). The report also briefly talks about the environment with the EU system of pollution allowance (a stricter law was so opposed by the U.S. airlines that they lobbied President Obama into writing legislation excluding them to pay ever—which in turn made the EU back down on the proposal). All in all, a smart answer, in addition to the video targeted at Europe they recently published. Of note, Tim Clark has stated that Emirates would seek all options for redress if any commercial damage could be established. The full report can be read over at Emirates.com. It's embedded at the end of this post for your convenience.